Despite the success of mobile money, there are still challenges the technology is facing. They are not definite show stoppers but are bottle-necking its growth. I will not only transparently outline these but will provide some solutions or ideas at the end of each problem. Each network has its own mobile money network. Money cannot be sent to another user on another network without a hustle and heavy charges. 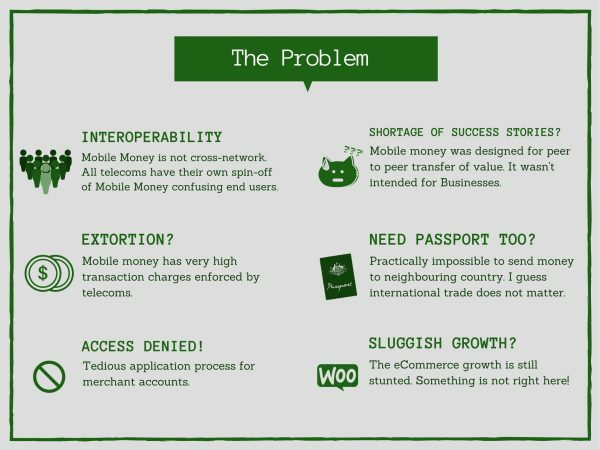 In simple terms, mobile money is not cross-network. The end user should not be worried about what network they are using, they just want to keep and use their digital money when needed. The problem can easily be solved by creating an independent, easy-to-use and unified API (Application Programming Interface). The API should be able to receive and send money regardless of network. Developing a network independent mobile wallet that allows for cross-network transactions using the API above. As of 1st July 2018, The charges below will include 1% tax of amount being deposited as directed by the Government of Uganda. This charge only applies in Uganda. The high transaction costs have inadvertently forced the end users to use mobile money only when cash cannot work. In the ideal world, digital money offers better benefits than century old hard cash. Adoption of mobile wallets that allow transfers at a lower cost. The end user incurs the network charges when topping up from mobile money or when sending to mobile money only. Sending between users in a mobile wallet comes at lower costs. If you have tried getting access to the mobile money API before then you will understand what i am saying. The process is more geared towards businesses requiring various company documents, waiting periods up to 3 months and the shortage of developers to implement integrations. Having said that, 90% of the casual traders and end users are cut out instantly. This is one of the main reasons e-commerce is delaying to take off despite the existence of the mobile money API. Unify the mobile money API using money money wallets. It is important to remember that Paypal become big because the process of getting the VISA API was hard for the casual user. In the end, mobile money wallets should be seen from the perspective that they can encourage use of mobile money rather than competition. Some platforms like socialpay have taken advantage of the Easypay API and created a mobile money plugin that can be integrated within any wordpress ecommerce website within just 4 steps (5 minutes work) eliminating the hurdle of lack of skilled developers and hustles of getting the API from the network. You would think mobile money networks would support the uptake or usage of mobile money by supporting startups but i beg to differ. Instead, they are mostly viewed as competition and suppressed. This has led to a large monopoly, scaring any sort of creative startup that would take advantage of mobile money payments. Networks should provide support, technical or financial, to startups that provide value added services that are not core. This can be done through their Research and Development programs. It is practically impossible to send mobile money from one country to another without very heavy transaction charges. Having a unified API for the different mobile money implementations. This API should also have an automatic forex exchange with the latest rates. I could go on forever but for the sake of this article, ill only state the main ones i have observed working in Fintech. Most of the problems facing mobile money can be solved with technology, so why are they not solved? Well a lot has to do with the regulations imposed on digital currency and the monopoly enforced by networks. In short, mobile money is growing but risks to lose to competition offered by cryptocurrencies like bitcoin or ethereum. Easypay Mobile Wallet has bundled all the above solutions into an all in one product that can be used to increase e-commerce and mobile money penetration within Uganda.